We interrupt my normally scheduled outfit post with a 5 for Friday instead. Sorry, life happens sometimes, and my resident photographer was out-of-town for the majority of this week. So, that means no photos since I don’t have a tripod, and I’m not about to try to figure out how to use one. 1. I got to meet some really sweet fashion bloggers at the Elle Fashion Magazine Party at Diane von Furstenburg Bellevue Square, hosted by Cassandra Lavalle of Coco + Kelly, on Thursday. It was tons of fun trying on the iconic DVF wrap dresses, enjoying some cocktails, and getting to know each other! Bri of Work Clothes, I Suppose, Katrina of Demure Muse, Sarah of SarahChristineStyle, and yours truly. 2. I learned how to unclog the shower drain, without using harsh, yucky chemicals like Drano! If you need to do this too, dump 1/2 cup baking soda into your drain. Kind of pack it in there, then pour 1/4-1/2 cup distilled white vinegar over top. Let it do its thing, then continue adding vinegar to the drain until all the baking soda is gone. Then run some hot water through the pipe, and you should notice a huge difference. If not, rinse and repeat! 3. I also learned that flying into Sea-Tac between the hours of 8pm and 11pm is the worst.idea.ever. Dave’s flight came in right in the middle, at 9:30pm, and I wanted to shoot myself. Not only was the entire Cell Phone Waiting Lot a nightmare to get out of from all the traffic, but the terminal was all backed up too. Amazingly, the pick up zone was the easiest to navigate since he flew Delta. Needless to say, we didn’t get home until after 11pm, and the airport isn’t more than 15 minutes away. Awesome. 4. My StitchFix arrived yesterday. I won’t lie, I’m a bit underwhelmed. I’m not sure about modeling what I got in my box, unless that’s more helpful. Yes, maybe, don’t care? Let me know. What was the best thing that happened to you this week? Happy Friday! That party looks fun! I love blogger meet ups. Sarah’s skirt is so pretty, too! Sounds and looks like that was one fun event! Playing dress up with DVF sounds like a dream! Oh I like Katrina! She’s super nice! Also, I’m so picky about clothes, I don’t know if StichFix will work for me. Do they have filters like: Don’t make me look fat/old? Haha! They do have style profiles, and allow you to leave them lots of comments and share a style Pinterest board with them. I’ll be posting the Fix I got on Thursday… I can’t say I’m in love with any of it though. I’ve seen some really good ones, and some really bad ones. Mine was kind of “meh”. Oooo, I wanna know more about what was in your Fix! Ugh, I feel you about the StitchFix thing. I loved the idea of it, but I felt like the clothes were always suburban mom clothes. It seemed like the more specific I got with my feedback, the worse it got– not to mention I thought lots of the clothes were overpriced for the quality. I only stuck with it for a couple months and decided it wasn’t worth it. I’ve been considering trying Golden Tote, but haven’t made up my mind yet. Thanks for the tip on the Golden Tote swap! 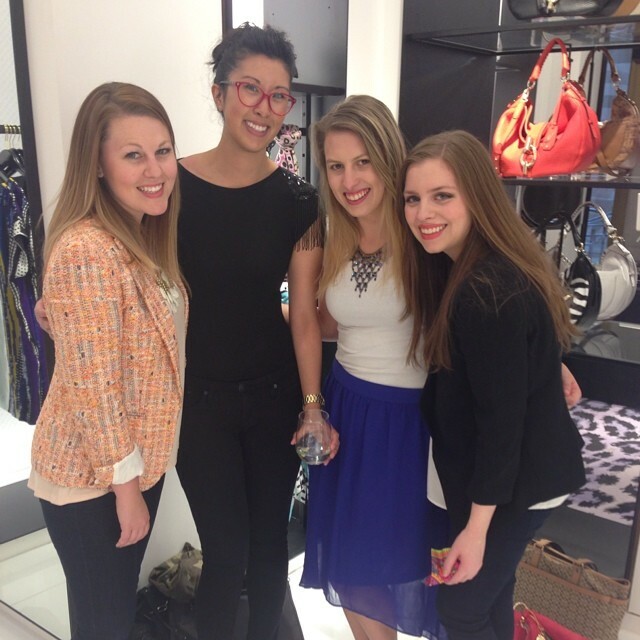 So cool you got a nice blogger meet up and at DVF no less! Ooh, thanks for the drain tip! I can’t believe I didn’t have to use a drain snake when I lived in an apartment. That was the most terrible thing ever. Never use a drain snake. I think you should post the stitch fix anyway, just because they’re always interesting to me. That sounds awful. We still have a clogged sink in our bathroom (from Dave’s face shaving, yuck!) that he gets to take care of. Womp womp.